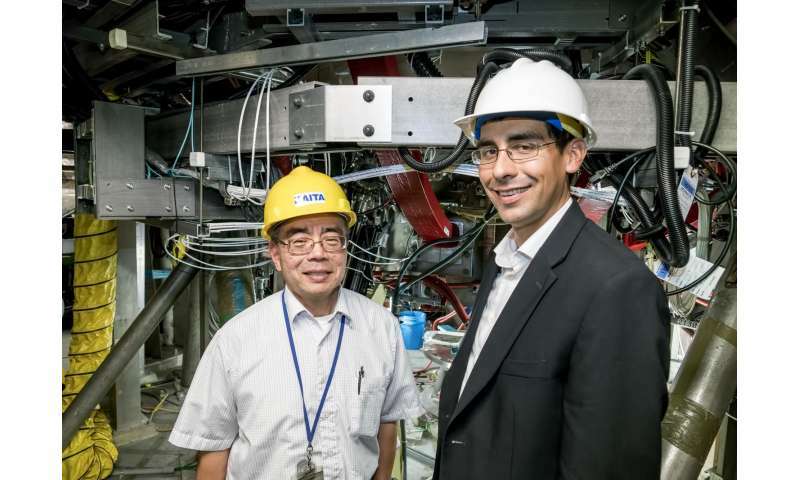 Lithium compounds improve plasma performance in fusion devices just as well as pure lithium does, a team of physicists at the U.S. Department of Energy's (DOE) Princeton Plasma Physics Laboratory (PPPL) has found. 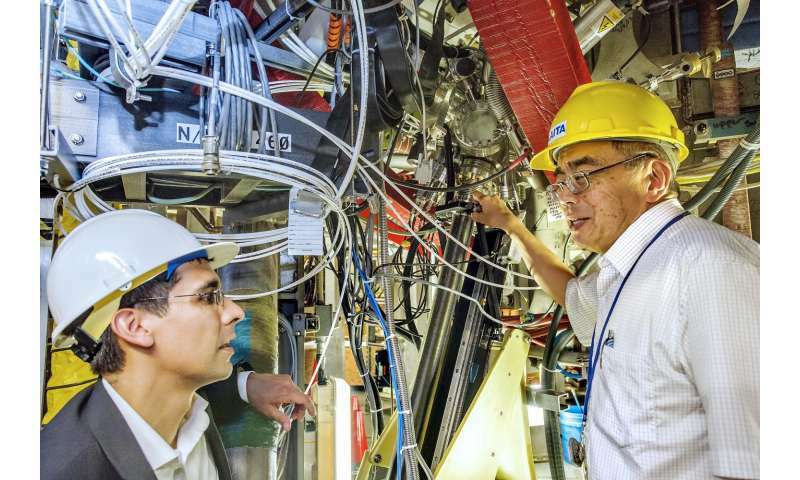 The research was conducted by former Princeton University physics graduate student Matt Lucia under the guidance of Robert Kaita, principal research physicist at PPPL and one of Lucia's thesis advisors, as well as the team of scientists working on a machine known as the Lithium Tokamak Experiment (LTX). As part of his dissertation, Lucia investigated how lithium deposited on walls of doughnut-shaped fusion machines known as tokamaks affected the performance of LTX. Like the plasma within a tokamak, the plasma within LTX is shaped like a doughnut. The plasma, a soup of charged particles, is surrounded by a copper shell with an inner wall made of stainless steel. Lucia used a new device known as the Materials Analysis and Particle Probe (MAPP), invented at the University of Illinois at Urbana-Champaign and installed on LTX. The MAPP system lets scientists withdraw samples into a chamber connected to LTX and study them without compromising LTX's vacuum environment. MAPP lets scientists analyze how tokamak plasmas affect a material immediately after the experiment ends. In the past, scientists could only study samples after the machine had been shut down for maintenance; at that point, the vacuum had been broken and the samples had been exposed to many experiments, as well as to air. Lucia used the evaporation technique to coat a piece of metal with lithium, and then used MAPP to expose the metal to plasma within LTX. As he expected, Lucia observed lithium oxide, which forms when lithium reacts with residual oxygen in LTX's vacuum chamber. He was surprised, however, to find that the compound was just as capable of absorbing deuterium as pure lithium was. "Matt discovered that even after the lithium coating was allowed to sit on the plasma-facing components within LTX and oxidize, it still was able to bind hydrogen," said Kaita. "For a while, we were thinking you had to have high-purity lithium because we thought that if the lithium already has a dance partner—oxygen—it's not going to dance with hydrogen," said Mike Jaworski, research physicist at PPPL and co-author of the paper. "We thought that once it was oxidized, lithium would be chemically inert. But in fact we found that lithium will take all the dance partners it can get." Lucia's results are the first direct evidence that lithium oxide forms on tokamak walls and that it retains hydrogen isotopes as well as pure lithium does. They support the observation that lithium oxide can form on both graphite, like the tiles in NSTX, and on metal, and improve plasma performance. The results support past findings involving PPPL's National Spherical Torus Experiment (NSTX), a tokamak. In 2010, scientists placed a large metal ring coated with lithium on the floor of NSTX's vacuum vessel. This device, known as the Liquid Lithium Divertor (LLD), was the first attempt to create a large lithium-coated metal surface inside NSTX. Later, after the NSTX divertor had been exposed to residual oxygen in the vacuum vessel, scientists studied the divertor's surface. The researchers heated the divertor and detected deuterium. The finding hinted that the deuterium had been trapped by the lithium oxide in the LLD, but the evidence was not definitive. These new findings indicate that lithium within tokamaks may not have to be as pure as once thought. They also show that if the carbon tiles in NSTX, now the National Spherical Torus Experiment-Upgrade (NSTX-U), are replaced with metal tiles and coated with lithium, the plasma performance should not decline. "The key thing is that we can keep on using lithium evaporation if we go to metal walls in NSTX-U," Kaita said. The team has to do more research to determine whether these findings will apply to future plasma machines, which might have flowing liquid metal walls that could contain both lithium and lithium oxide. 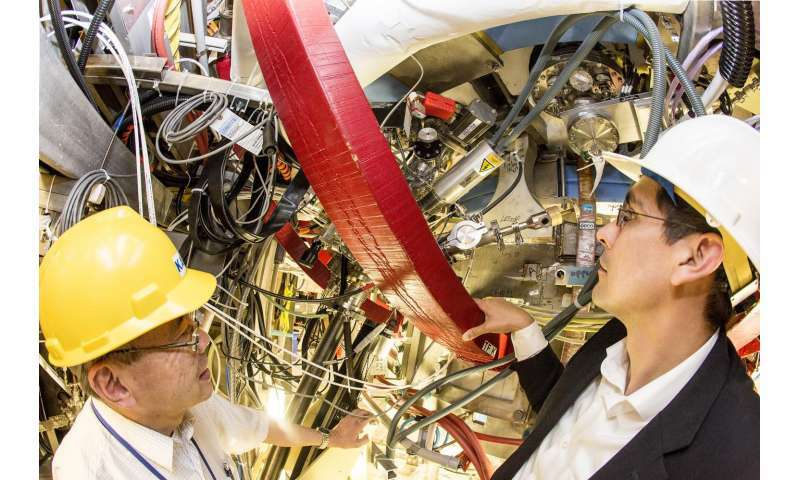 "If we want to extrapolate our results to a fusion reactor, we have to ask whether the experiments are indicative of the performance we could expect in the future," said Jaworski. The next step in this research would entail measuring precisely the hydrogen retention rate of both pure and oxidized lithium, and comparing them rigorously. The findings appeared in the April 2017 issue of Fusion Engineering and Design. The research was funded by the DOE Office of Science (Fusion Energy Sciences). So wake me up when someone achieves a fusion reaction lasting over one hour and in a that doesn't require extensive maintenance after the run. Fusion power always seems to be twenty some-odd years into the future. It's been that way for 50 some-odd years. I don't know anything about nuclear physics, but I gather this wet blanket surrounding the reaction is the key part of fusion, so this work is really important, but I dont understand why. I read about something called 'demon core' that showed neutrons can be reflected by neutron mirrors, they can even have gratings for neutron holograms and such. So why doesn't a fusion reactor use this to shoot out a beam of neutrons somewhere, instead of absorbing them itself? Probably stupid question, but I really wonder. @luke, I think the idea is to absorb the neutrons into the lithium, which can absorb them without becoming radioactive, to reduce or eliminate radioactive contamination of the other materials in the reactor. But that's just a guess; the article isn't all that well written. Thx Da Schneib. I guess I'll have read more about the basics of fusion design. I can clarify it a little bit, having done some digging: apparently the lithium has a serendipitous effect which is to help stabilize the plasma, in addition to absorbing stray neutrons from the reaction. Unfortunately the article doesn't discuss how this effect works. A scientific theory is an explanation of some aspect of the natural world that can, in accordance with the scientific method, be repeatedly tested, using a predefined protocol of observations and experiments. Established scientific theories have withstood rigorous scrutiny and are a comprehensive form of scientific knowledge.